Chapters were tasked with capturing the spirit of NPW in a creative group photo featuring the NPW artwork. The Atlanta Chapter won first place with their displayed NPW proclamations and patriotic flair. The Online Survey Promotion Contest rewards those who go above and beyond to promote the “Getting Paid in America” survey. The first place winner, the Greater Nashville Chapter, encouraged their members to participate by holding a gift card drawing for everyone who completed the survey. NPW merchandise makes promoting payroll fun! The Atlanta Chapter won the Chapter Promotion Contest by collectively purchasing over $1,400 worth of items. All proceeds go towards helping the APA promote the payroll profession. The Educational Outreach and Community Services contest recognizes chapters who volunteer their time and efforts to give back to the community. First place winner, the Northeast Wisconsin Chapter, raised $500 for a college scholarship, donated items to local shelters, and participated in two builds with Habitat for Humanity. 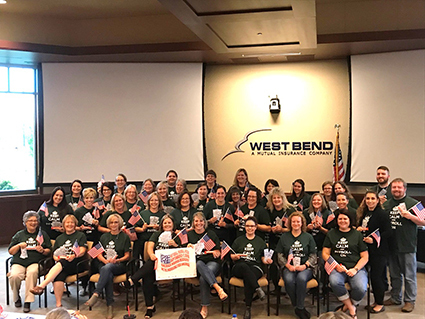 In 2018, the Chicago Chapter received a total of 33 proclamations, earning significant government recognition for the payroll profession as well as First Place in the Local Government Outreach contest. APA and its chapters use local media outlets to promote NPW and paycheck resources to the community. The Alamo Chapter won first place for the 2018 contest with its billboard sign and an appearance on the local news in San Antonio where they encouraged viewers to use NPW as a time to perform a “paycheck checkup” with the help of their payroll professional. Payroll professionals can make an impact by promoting and celebrating National Payroll Week at their workplace. 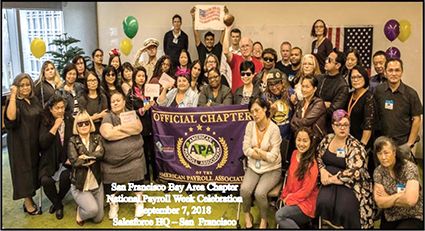 The 2018 winner, David Scorza, CPP, celebrated at ADP through social media and email campaigns, payroll polls, sweet treats, games, certificates of appreciation, and a charity donation. On Money Matters National Education Day, volunteers across the country taught paycheck basics to students preparing to enter the workforce. With a total of 578 students reached in 2018, volunteers in Region 4 (New Mexico, Arizona, Colorado, and Texas) took the top spot as the NPW National Education Champions. Congratulations to all 2018 NPW Contest winners and thank you to all who participated. Comment below and let us know how you were involved with NPW this year!